- Steel case electrostatic powder painted and dried. 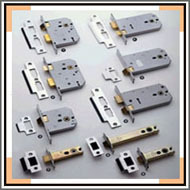 - Extruded brass latch loaded with three stainless steel spring mechanism for smooth movement. - Forend plate of stainless steel. 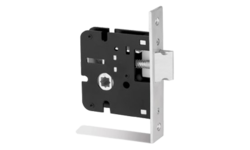 - The keyless latch can be opened from either side of the door by turning the handle. - Ideal for homes, office, cabins, hotel rooms, kitchen doors, bedrooms & bathrooms. Mortise locks & latches Door lever handles & knobs Brass cabinet rings Door rings, Padlocks, Master key system padlocks, Door closer sare part of our range of Hardware items. - Bolt, Frontal & Strike Plate, Sprindle Mouth made from finest Brass. - Cylinder available in lacquered brass or nickel-plated finish..